I'd like to alert you to something special -- and free -- from our friends at Elliott Wave International. It comes in two parts, both of which can benefit you. 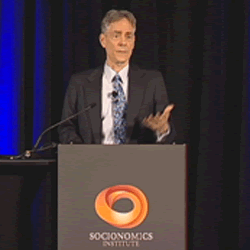 A 26-minute video excerpt from Robert Prechter's April 2012 speech at the Socionomics Summit in Atlanta. He described the then-just published landmark research paper he had co-authored, which amounted to a stunning (and stunningly accurate) preview of the outcome of the recent presidential election. If you've wondered why Obama won/Romney lost, Bob Prechter pulls back the curtain about a truth you won't hear elsewhere. The opportunity to join Club EWI. Sign up and you'll be notified about the latest developments in cutting-edge stock market analysis PLUS the most up-to-date research in the field of socionomics. Membership is free, and ensures that you have access to exclusive resources, special reports and unique insights that will help you take your understanding of the markets and socionomics to the next level. That's it -- a rare combination of value for zero cost, that's fast and easy. It's available until noon Eastern Wednesday, Dec. 12, exclusively via this link.